It looks like before my next race I will be ingesting several spoons of yellow mustard followed by a pickle juice chaser. 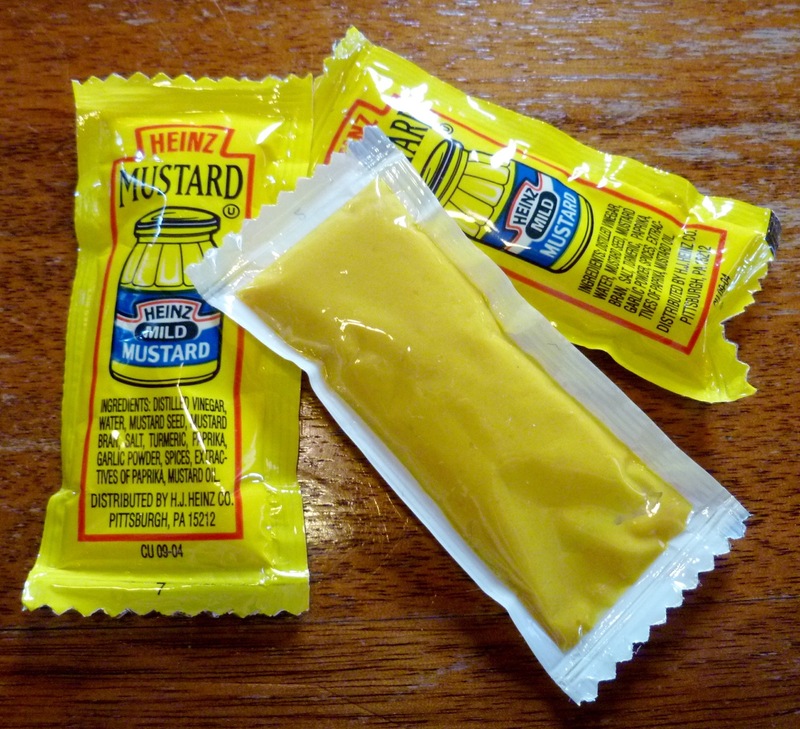 When I told my wife about distance runners combating leg cramps with packets of mustard, she indicated that it might be because they had to slow down to vomit after consuming the mustard while on the run. It is true that decreasing speed to reduce stress on the cramping muscles is one response that works, but the slowing down part is not something I’m interested in pursuing. This blog is about avoiding slowing down. Before I discuss remedies to leg cramping during racing, let me review the potential causes. I would say that the most commonly mentioned cause of leg cramps is dehydration. Muscles are 60% water and the way that many articles discuss the connection between dehydration and cramping makes it appear that there is an obvious link between water loss and cramping due to this fact. It appears, however, that rather than causal, there is merely a correlation between dehydration and cramping. I did find it interesting that while watching some college football recently, when players started experiencing severe leg cramps on the field, reports from the bench stressed dehydration and announcers were quick to confirm this diagnosis. A recent New York Times article, “A Long-Running Mystery, the Common Cramp (February 14, 2008),” by Gina Kolata, actually calls into question the connection between dehydration and cramping. Kolata cited the expertise of Dr. Schwellnus, who studied cramping athletes and found that they were no more dehydrated before or after a race than those who did not have cramps. I think it is also telling that some early medical writing concerning distance running – Bob Anderson and Joe Henderson’s 1975 classic, Guide to Distance Running – doesn’t even mention water loss as a harbinger of leg cramps. This leads us to a consideration of the second major theory of running cramps – the electrolyte hypothesis. This theory rests upon one of the earliest and commonly agreed upon reasons for cramping: sodium deficiency. The Guide to Distance Running recommended salt tablets as a cure, and provided a recommended intake schedule: it seemed like a lot of salt. Sodium deficiency, however, is still seen today as a problem. How does it work? According to Dr. Michael F. Bergeron, in “A Long-Running Mystery, the Common Cramp,” when the fluid that bathes the connection between muscle and nerve is depleted of sodium and potassium through sweat loss, the nerve becomes hypersensitive and cramping results. Bergeron’s description of the cramping process accurately describes how my leg cramps have always progressed: little twitches followed by full-blown cramps. His remedy?Drink salty fluids. Thinking that sodium deficiency might have been a contributor to my leg cramps while racing, I made sure that I ate a salty meal the night before my latest race. 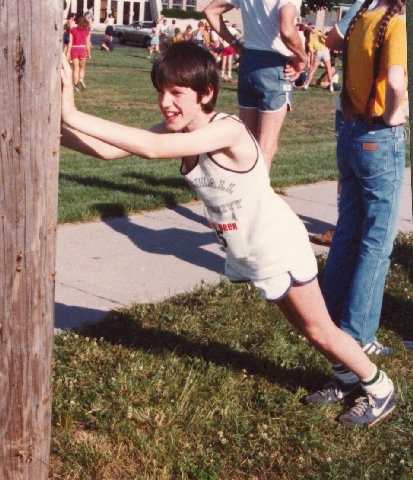 I also had Gatorade to drink on the morning of the race. Considering that I experienced cramping during my recent 10K earlier than I had during my half-marathon, I concluded that sodium might not be the answer. It is, of course, possible that I didn’t have enough salt, or that there are several variables working together to contribute to my leg cramps. Despite the fact that there seems to be a consensus that sodium depletion leads to cramps, Dr. Bergeron had to admit that there were not any rigorous studies to confirm the electrolyte hypothesis. In fact, despite sounding like what many of us experience, a recent examination of Iron Man triathletes and other endurance athletes found no differences in electrolyte levels between those who experienced muscle cramps and those who didn’t. If we can’t directly attribute leg cramps to dehydration or sodium deficiency, what is the next viable theory? It’s the fatigue theory. According to Dr. Schwellnus, cramping is caused by an imbalance between the nerve signals that excite a muscle and those that inhibit its contractions. The critical imbalance occurs when a muscle grows fatigued. His recommendation is to exercise less intensely and for shorter times and to regularly stretch the problematic muscles. Interestingly enough, the Guide to Distance Running also cites fatigue as a cause of leg cramps – too much running at too high intensity without adequate rest essentially makes one more susceptible to cramping in subsequent runs. The fatigue theory makes some sense for those of us who only experience cramping issues while racing. Ominously, my leg cramp issues have emerged as I have quickened the pace during races. Over the last year, I have gotten faster and this has required greater intensity. I am wondering if my endurance has outstripped my muscular-skeletal capacity, thus resulting in the ability to overstress my body during racing. Obviously, we can’t really endorse Schwellnus’ recommendation to exercise less intensely, although we can get behind additional stretching and massage. After having assessed the prevailing theories behind cramping during running, and finding convincing evidence that there is little agreement on what causes cramping, we are still left with the pragmatic consideration of what to do. My own experience would indicate that dehydration is probably not the problem, although lack of fluids is directly linked to sodium depletion, which might be a problem. This uncertainty, again, points to the problem of adjusting several variables at once, thereby obscuring what may or may not be working. In response, I am going to do something entirely different. I just read an article by Pete Williams, “Mustard: A Cure for Cramps?” on the Core Performance website (CorePerformance.com) that suggested eating one or two spoons of yellow mustard to prevent muscle cramps. The theory is that cramps can be caused by a deficiency in acetylcholine, the neurotransmitter that stimulates muscles to work and mustard contains acetic acid, which helps the body produce more acetylcholine. Williams points out that it is possibly the vinegar common in both pickle juice (a traditional anti-cramp remedy) and mustard that stimulates the necessary neurotransmitter. There are, of course, no scientific studies on the connection between vinegar and cramp prevention, but the anecdotal evidence convinces Williams. He also mentions that ingesting mustard packets might merely also be another way of getting additional sodium. For me, the mustard cure has an appealing magic bullet aspect that I am willing to try. Hey, I like mustard, so the idea of having several spoons before a race with the possibility that I will not have to experience leg cramps is very appealing. The theory of why it might work doesn’t sound totally wacky. I’ll report back after my next race.